Galinsky, Adam D. and Maurice Schweitzer. Friend & Foe: When to Cooperate, When to Compete, and How to Succeed at Both. Crown Business, 2015. Prof. Galinsky is also an engaging writer. He presents these topics (and more) in a new book that he wrote with Wharton faculty member Maurice Schweitzer. In Friend & Foe, Galinsky and Schweitzer explain that human beings are inherently both cooperative and competitive. By nature, people compete when resources are scarce, but as social animals, they cooperate when resources are plentiful. In modern society, interactions among people are complex and require a balance of both behaviors. Galinsky and Schweitzer explain that comparisons between people are inevitable. Competing with those with better skills can motivate people to improve their performance, but they can also trigger resentment or unethical behavior. Competing with the less skilled makes people feel satisfied. Finding the right balance is key to remaining motivated and happy. The most interesting discussion in the book is about power. The authors present academic research that demonstrates that in a social interaction, personal power can be increased by merely thinking of a prior experience with power. Power can also be increased by adopting a power stance, standing tall, arms akimbo, legs spread. In addition they show how powerful people are often unaware of the perspectives of others and can improve their leadership skills by considering the vantage points of others. In addition to discussing academic research, Professors Galinsky and Schweitzer use dozens of stories to provide practical advice on topics, such as: How to negotiate; How to build trust; How to detect deception; How to apologize; How to choose a good name. 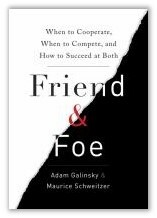 The new book, Friend & Foe, is recommended for all readers and as Fuqua staff discovered yesterday, author Adam Galinsky comes highly recommended as a speaker. Farrell, Chris. Unretirement: How Baby Boomers are Changing the Way We Think About Work, Community, and the Good Life. Bloomsbury Press, 2014. For decades, conventional wisdom about the long term viability of Social Security benefits was gloom and doom. When the baby boom generation reached retirement age and drew on Social Security benefits, the entitlement system would be strained, requiring lower benefits and higher taxes, perhaps going bankrupt altogether. With only three workers to support each retiree over 65, Social Security was deemed unsustainable. But according to business journalist Chris Farrell, the current outlook is far more optimistic. In his new book, Unretirement, Farrell argues that aging baby boomers are not behaving as their predecessors. Instead of retiring at their earliest opportunity and moving to Florida to play golf, baby boomers are working longer, either remaining at their full-time jobs, transitioning to a non-profit, downshifting to part-time work or putting their experience to work as independent contractors. Farrell estimates that the average age of retirement will rise to 70 over the next 25 years. This bodes well for Social Security because people who work longer continue to contribute and have fewer years to draw on the benefits. Baby boomers are better educated and healthier into their 60’s and 70’s than previous generations. They seek meaning through work and stay engaged in their communities. A frugal mindset and distrust of Wall Street are taking root. Farrell explains retirement planning for this group is less about investing, and more about staying on the job, developing new skills for an encore career, maintaining social contacts and delaying Social Security benefits. Farrell admits that unretirement will not be enjoyed by all. Workers with limited skills in low paying jobs have bad prospects as they age. But he predicts that the majority of older Americans will experience personal financial security and the U.S. economy will undergo a long period of prosperity despite its aging population. Recommended.